A SUICIDE bomber has killed at least 25 people, many of them police, in the eastern Pakistani city of Lahore, an attack which shatters a period of relative calm in Pakistan’s second-largest city. The Pakistani Taliban claimed responsibility for the attack on Monday which wrought carnage near the Lahore Technology Park in the centre of the city. Police deployed to clear street vendors from the area had been targeted, a police official said. “We suspect that he (the suicide bomber) came on a motorcycle and he rammed it into a police checkpoint,” Lahore police operations chief Haider Ashraf told Reuters. Rescue workers shifted the wounded to hospital and police officers cordoned off the bomb site as army troops also arrived at the scene. “The death toll we have now is 25 dead and 52 are wounded,” said Jam Sajjad Hussain, spokesman for the Rescue 1122 service. A wounded man sitting on the roadside was shown crying in pain on television amid cars and motorcycles mangled by the blast. 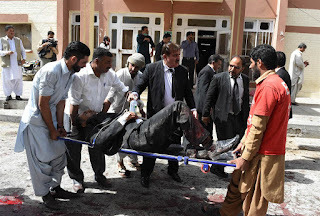 The bombing was claimed by the Tehreek-e-Taliban, also known as the Pakistani Taliban, in a message sent to the media by spokesman Muhammad Khurassani. The Pakistani Taliban are loosely allied with Afghanistan’s Taliban insurgents but focus their attacks on the Pakistani government. Bomb blasts by militants are common in Pakistan, especially in tribal areas bordering Afghanistan, but attacks in Lahore have become less frequent in recent years. 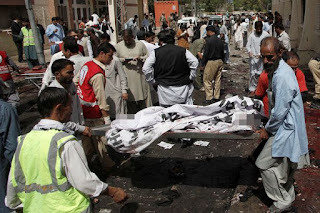 Haider Ashraf, deputy inspector general of Punjab police, said the blast was a suicide attack and “police were the target”. Interior Minister Chaudhry Nisar Ali Khan said the majority of those killed and wounded were police and warned the death toll could rise. Prime Minister Nawaz Sharif condemned the blast in a statement and directed medical efforts for those injured.